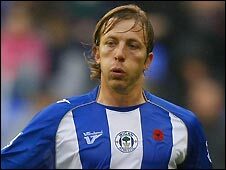 Wigan defender Erik Edman has left the club after having his contract cancelled by mutual consent. The 31-year-old Swede signed from Rennes for £500,000 in January 2008, but has started two Premier League games this season. His last start came in the Latics' 9-1 loss at Tottenham in November, when he had a torrid time against Aaron Lennon. Edman was behind Maynor Figueroa in the Wigan pecking order and is now expected to return to Sweden with Helsingborg. Edman has 36 Swedish caps and played in every game for his country in the 2006 Word Cup finals.